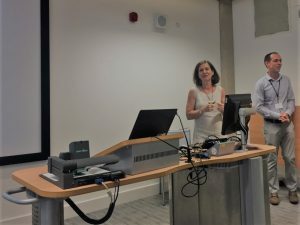 On Friday the 20th of July 2018, ColloCaid principal investigator Ana Frankenberg-Garcia and researcher Geraint Rees presented a paper about the ColloCaid project at TaLC 2018 in Cambridge, United Kingdom. 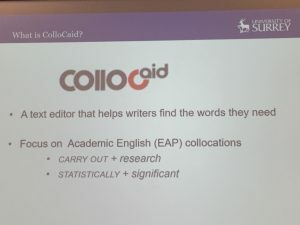 The paper focused on the role of the ColloCaid tool in helping academic writers acquire collocations. It also outlined the rationale underlying the tool’s lexicographic coverage and preliminary visualisation decisions. More specifically, it described the criteria used for (1) choosing which collocation bases (nodes) to cover, (2) selecting collocates and examples from expert academic English corpora, and (3) integrating information on collocations with text editors. The presentation ended with a live demo of a prototype of the tool.